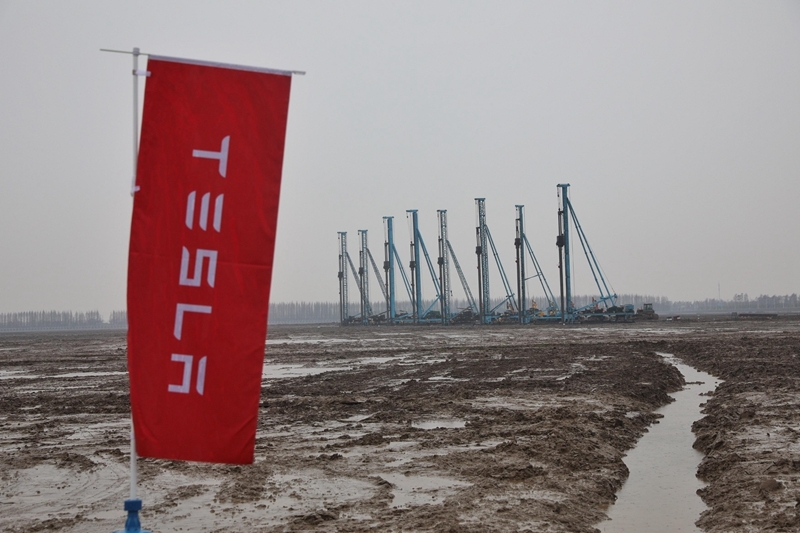 The 84-hectare Tesla factory complex going up 80 km southeast of downtown Shanghai signals a shock wave that’s about to hit the world’s largest auto market. The American electric carmaker is expected to bring a new level of competition to China’s chaotic, crowded and heavily subsidized new-energy vehicle market, also the world’s largest. Policymakers have long courted domestic competition from Tesla to help rationalize the industry and are doing all they can to advance the project. At the same time, Tesla is about to realize founder Elon Musk’s long-held dream of expanding outside the U.S. and charging into the giant Chinese market. And after a series of setbacks at home, Tesla is counting on the China project to reinvigorate its prospects. Tesla’s $5 billion production complex in Lingang, which broke ground in early January, will not only be the company’s first car plant outside the U.S. but also will be the first wholly foreign-owned electric auto project under China’s new regulations for the industry. On Jan. 10, the same day that the China Development and Reform Commission released the new policy to ease controls on foreign investment in electric vehicle manufacturing, Tesla completed its registration, a Shanghai official said. Although Musk has projected that construction would wrap up in the summer and the first China-made Tesla Model 3 would roll out before the end of the year, local authorities are trying to help accelerate the timetable, a Shanghai official told Caixin. Another Shanghai official said the city government formed a special task force to advance the Tesla project. In January, the head of Lingang’s industrial development said regulators sought to reduce the approval period for Tesla’s complex to five months from the typical 15 months. Time is certainly of the essence for California-based Tesla. Until the new factory opens, Tesla has to continue importing all its vehicles from the U.S., extending its exposure to the risks of the U.S.-China trade war. According to Tesla’s financial reports, the company’s China revenue for the first three quarters of 2018 declined to $1.45 billion from $1.53 billion a year earlier as the trade war resulted in higher tariffs. 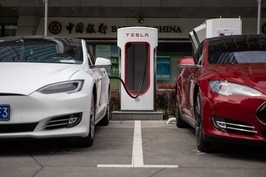 In the fourth quarter, Tesla’s share of China vehicle imports dropped to 14% from more than 40% previously, according to Cui Dongshu, secretary-general of the China Passenger Car Association (CPCA). China had 2.6 million registered electric vehicles by the end of 2018, nearly half of the global total. Domestic automakers are the main players, supported by government subsidies and preferential policies as part of the country’s ambitious push to get rid of fossil-fueled vehicles. Chinese authorities have taken steps to introduce greater competition to the electric car market as part of the efforts to open up the auto sector to foreign investors and further liberalize the economy. Bringing in Tesla was the best option for China advance its opening-up of the auto sector, analysts said. Authorities believe the country’s electric carmakers are better prepared than conventional automakers to compete directly with foreign rivals, a senior official said. 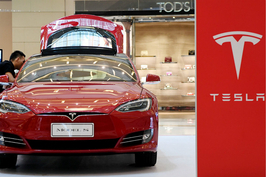 Tesla delivered its first vehicles to Chinese customers in April 2014. 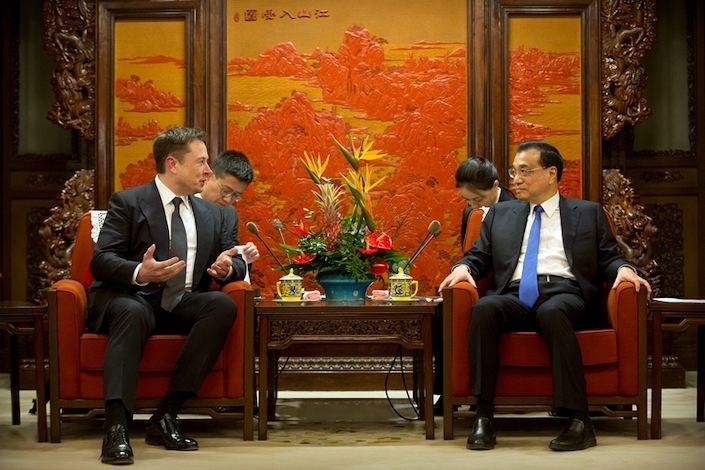 Since then, Musk has consistently pursued a goal of producing vehicles in China. But the plan has been repeatedly postpone. In October 2015, Musk said on Twitter that Tesla expected to open its China factory in 2018. 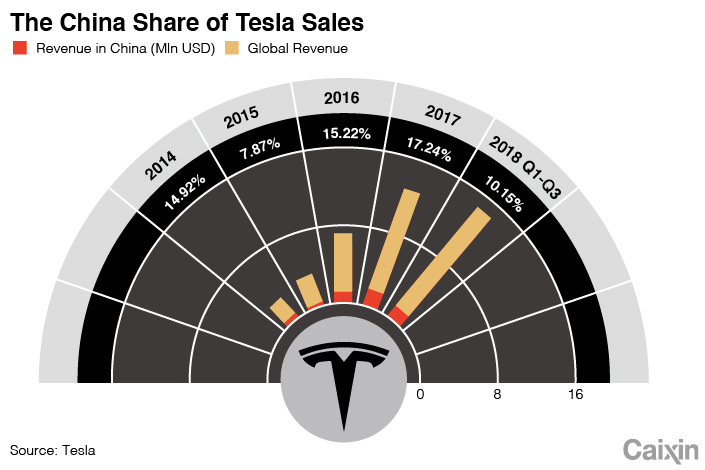 In 2016, Tesla’s China sales exceeded 10,000 units, or 13% of its global sales. The next year, Tesla delivered 14,779 cars to China. But Tesla’s efforts to establish a China factory ran into hurdles. Tesla objected to China’s regulations capping foreign ownership of automobile ventures at 50%, a Shanghai government official told the Central Television last October. 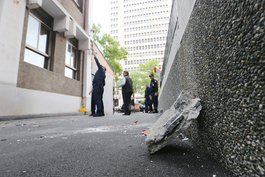 “Both sides were in a stalemate for a long time,” the official said. China’s move to open up its auto sector broke the stalemate. In April, Beijing unveiled its plan to gradually lift limits on foreign ownership in the auto industry, starting with the new-energy vehicle segment. The government also slashed tariffs on imported cars. But in the following months, the escalating Sino-U.S. trade war led to a rebound in Chinese tariffs on U.S. auto imports and squeezed Tesla’s China sales badly. While Tesla picked up the pace to launch its China plant, the company faced a series of setbacks at home. In August, Musk’s online remark that he hoped to privatize the company led to a $20 million fine from U.S. securities regulators for misleading investors. In November, Musk told media that Tesla had been on the verge of bankruptcy in the first half as it invested heavily to expand production of the Model 3. Tesla reported a $1.1 billion net loss 2018, although it booked net gains in the third and fourth quarters. Analysts said sales of Tesla’s Model 3, which debuted in 2016, will be key to the company’s profitability. Sinolink Securities predicted that sales of the Model 3 could contribute 62% of Tesla’s 2018 revenue and become a key driver for Tesla to turn a profit. The China plant, which Musk said will focus on production of the Model 3, will thus become a key segment of Tesla’s business. According to Tesla’s fourth-quarter financial report, the company plans to produce 3,000 vehicles a week at the Shanghai plant while increasing the capacity of its California factory to 7,000 a week. Domestic production will allow Tesla to avoid import taxes and reduce prices in China by 40%, CPCA’s Cui said. CITIC Securities predicted that Tesla will sell its China-made mid-range Model 3 at about 350,000 yuan ($51,610). Tesla has yet to offer the mid-range Model 3 in China. It sells the long-range version starting at 433,000 yuan. Musk told investors in August that Tesla would mainly rely on borrowings in China to fund the new plant and would raise no more than $2 billion. 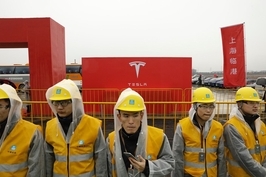 A Shanghai official said most of the construction spending on Tesla’s Lingang factory will be funded by syndicate loans involving several Chinese banks. “Banks are competing to provide loans” to Tesla, the official said. Some auto industry experts believe domestic production by Tesla will put significant pressure on China’s domestic electric carmakers, which have long enjoyed government protection and subsidies. China’s electric car market has grown into the world’s biggest in a decade thanks to the government’s generous supports, including subsidies to manufacturers and customers. However, the subsidy-fueled growth has led to distortions in the market and overcapacity. In 2016, a number of automakers were found to falsify sales figures to cheat for government subsidies, unveiling an industry-wide scandal of subsidy fraud. The government has since scaled back subsidy policies for electric cars. Industry experts expect that the subsidies will be completely removed after 2020. China’s electric car industry faces severe overcapacity with more than 400 players, said Sun Fengchun, an expert at the Chinese Academy of Engineering. Official data showed that in 2018, local governments announced new electric car projects involving 250 billion yuan of total investment and annual production capacity of 6 million units. That compares with sales of 1.25 million new-energy vehicles in China in 2018. Sales are projected to be 1.5 million this year and 2 million in 2020, according to the China Association of Automobile Manufacturers. Heightened competition from Tesla will especially affect startups such as Nio, analysts said. Nio Chairman Li Bin projected a tough year for China’s electric carmakers in 2019 after years of reckless expansion. Li said most of the country’s hundreds of car startups will be unable to make it amid intensified competition. In 2016, China’s then-Vice Premier Ma Kai called for domestic electric carmakers to improve their competitiveness and technology to prepare for foreign competitors such as Tesla. “The market opening-up is unstoppable, and the rivals are stronger than us,” Ma said. That year, Chinese automakers registered 3,411 electric car models, but only 77 of them had production of more than 1,000 units. That same year, sales of Tesla’s two models reached 76,000 units globally.